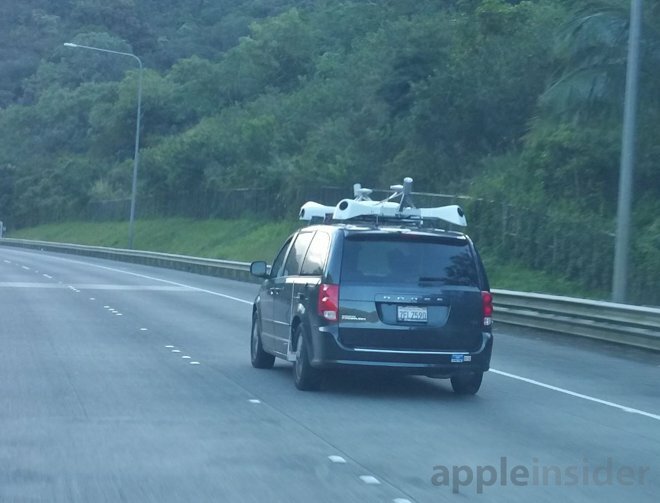 One of the camera-equipped vans thought to belong to Apple, spotted by AppleInsider reader matthawaii in Hawaii. Apple has put as much as $250,000 in signing bonuses and 60 percent raises on the table for its targets, Bloomberg reports. Despite the gargantuan size of those figures, few Tesla employees have jumped ship, while more than 150 former Apple workers have moved to Tesla. "Apple tries very hard to recruit from Tesla," Musk said. "But so far they've actually recruited very few people." Word of Apple's interest in Tesla employees comes days after the iPhone maker was revealed to be behind a fleet of mysterious camera-equipped vans that have popped up around the Bay Area in recent weeks. The vans sport more than a dozen cameras and what appear to be LiDAR modules for high-resolution mapping strapped to an x-shaped carriage on their roof. Some, like technology analyst Rob Enderle, believe those vans are test mules for new self-driving car technology. An alternative— and more likely— scenario is that Apple is preparing a major data collection initiative for Apple Maps, much like Google's Street View project. While the vans were first seen in San Francisco and New York, they have since been spotted in a number of more far-flung places. AppleInsider readers report sightings in Wisconsin, Hawaii, and Panama City, Panama.